Custom printed wedding sunglasses are pursued by couples as wedding gifts. This particular variety of wedding sunglasses are offered in 31 colors and couples can seek it accordingly. Assorted colors are also available. 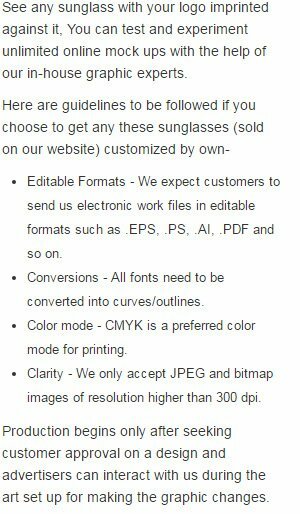 Custom printed wedding sunglasses are one of our best sellers. They also serve as a perfect accessory for beach wedding. Those seeking for personal gifting purposes can order custom printed sunglasses in bulk and seek benefits of free artwork. Wedding favor sunglasses are offered with free shipping and industry best price! Our custom sunglasses are becoming easy choice for couples planning beach weddings, color themed weddings, pre-wedding bashes and after-wedding parties due to their versatile design and affordable prices. They know these wedding party sunglasses will make their occasion livelier, fun and memorable as well as their guests will get a keepsake for a lifetime. No doubt, with such vast color choices, these custom wedding sunglasses will make your special day memorable and stand out among other ordinary events that mark the wedding. These rubberized sunglasses are empowered with UV400 lenses that offer 100% UVA and UVB Protection. You can customize these wedding party favor sunglasses with your initials or dates. Find our complete selection of best seller sunglass favors, just waiting for your personal message! Start the party with these custom sunglasses at guaranteed low prices!